The hair is now filled in for the darkest values and the highlights will then be added in using dry brush strokes and then softening so they blend in nicely with the darks. 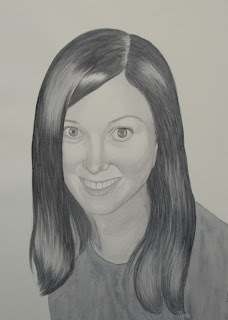 Then I will continue to refine her features, especially her eyes, then build up the tonal values on her skin and lips. Looking good Tracey! Nice highlights and I can already see the energy in the eyes. You definitely have an affinity for them.